Over the last year, the spread of voter photo ID laws and other new voting restrictions have earned widsepread attention from election watchdogs and the media. But one important issue has largely escaped public scrutiny: the large number of citizens blocked from voting due to a past felony conviction. In part, the lack of attention to felon disenfranchisement laws has been due to a dearth of fresh data. That changed last week, when the D.C.-based Sentencing Project, a criminal justice reform group, released a new report on the impact of disenfranchisement laws in each state. 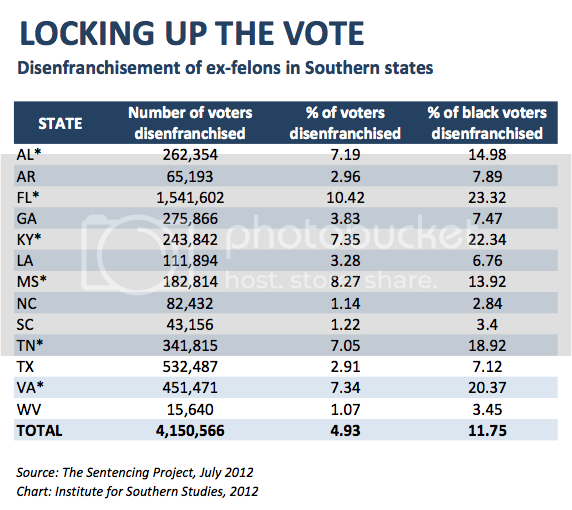 As covered before in Facing South, felon disenfranchisement laws have always had a unique history in the South, where they were used as a form of political control over newly-freed African-Americans. That legacy lives on today: According to Sentencing Project data, more than 4.15 million Southerners are denied voting rights due to felony disenfranchisement. That's five percent of the total Southern electorate, and more than 70 percent of the 5.85 million voters nationally barred from voting by such laws. The racial legacy lives on, too: Nearly 12 percent of black voters in Southern states are barred from casting a ballot due to felon disenfranchisement laws. In Florida, Kentucky and Virginia, more than 20 percent of African-Americans are denied the franchise. Laws denying ex-felons the vote unquestionably have an impact on election results. While many Democrats blame the outcome of the Florida 2000 election on Ralph Nader's 97,421 votes, a bigger factor was the 827,000 voters -- disproportionately African-American and Democratic-leaning -- blocked under the state's disenfranchisement law. That could be the case again in 2012. In Florida, for example, former GOP governor Charlie Crist famously relaxed the state's prohibitions on ex-felon voting. But in 2011, Republican Gov. Rick Scott reversed course, ordering a five-year waiting period before voting rights can be restored. Today, one in 10 eligible Florida citizens are banned from voting under the laws -- the highest disenfranchisement rate in the nation, and a huge swath of the electorate in one of the country's biggest battleground states. Read a full copy of The Sentencing Project report here [pdf].